When I say "salt", what's the first food that pops into your head? Salted caramel? Hot crispy french fries? Mmm.... Stop! Now I'm getting hungry! But what about these: Bread? Soup? Cereal? Cookies? Yep, all have salt, and probably more than you'd expect. Like it or not, salt is in so many foods that we enjoy every day. It's an essential ingredient in baked goods, savory snacks, even desserts. It adds savory flavor, enhances sweetness, and acts as a preservative. Now, salt (and by "salt" I mean sodium), has an unfair bad reputation. It's actually essential for us to live. The problem is too much. Too much salt can contribute too high blood pressure, which can increase your risk of heart attack and stroke. It is estimated that 90% of Americans over 2 years old consume too much salt daily. The 2015-2020 US Dietary Guidelines recommend we eat no more than 2,300 milligrams (mg) of sodium daily, but the average American over 2 years old consumes 3,400 mg daily. That's about one and a half times the MOST we're supposed to eat! As you can see, there's a lot of room for improvement. By reducing how much salt you eat, you can improve your blood pressure and help keep you and your family healthy. No calculators needed. No adding up milligrams, counting every grain of salt you add to your food. It takes only a second and can make a huge difference. Look at the Nutrition Facts label when shopping, and compare how many calories are in a serving versus milligrams of sodium. Make your goal for the milligrams of sodium to be LESS THAN the calories per serving. A very, very general estimate of how many calories you need in a day is around 2,000. The recommended sodium intake is no more than 2,300 mg daily. So if you ate 1 milligram of sodium for every 1 calorie, you'd eat about 2,000 mg sodium and 2,000 calories. You'd be right on track salt-wise, and even have a little extra in the bank. By choosing foods with LESS sodium than calories, you also leave yourself wiggle room for eating out, adding salt when cooking, and for those foods that just never have less salt than calories (see below). Some days will be better than others, but overall, there will be more balance and less salt overall in what you eat. 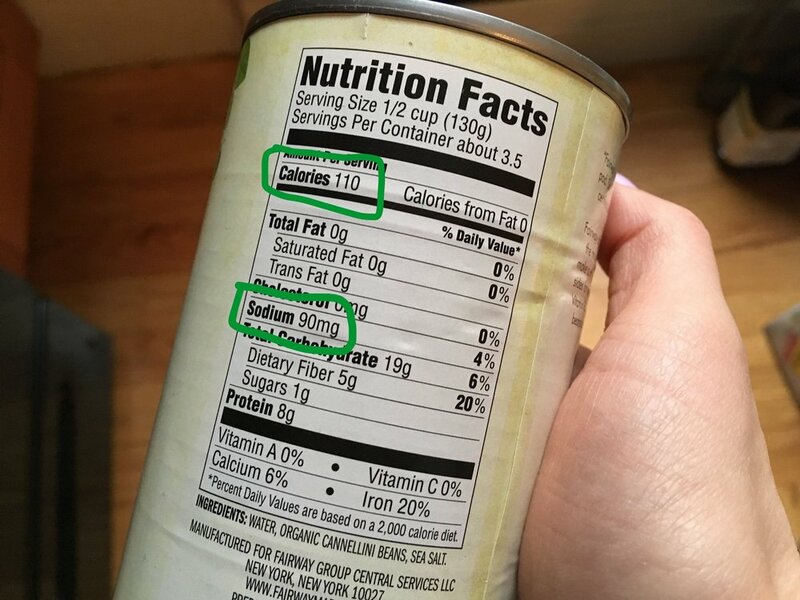 These canned beans have 110 calories per serving and only 90mg of sodium. Go for it! Oof! 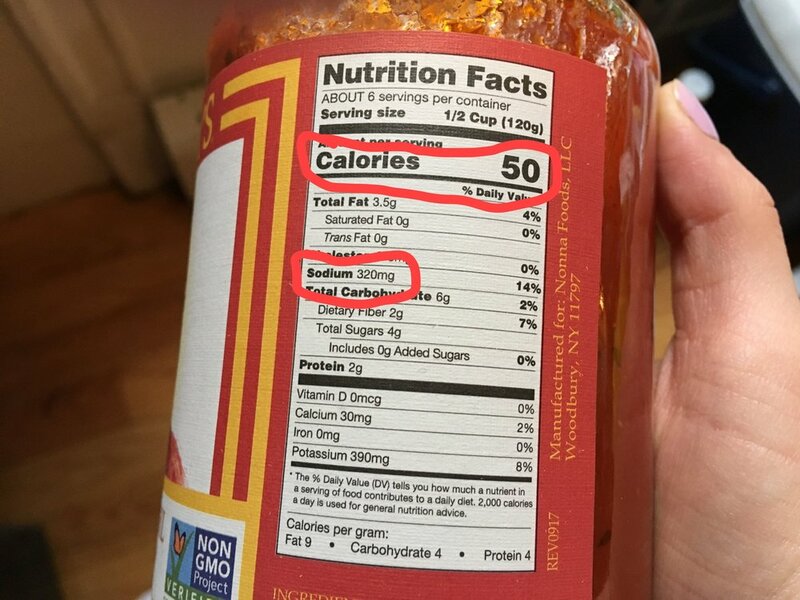 This jarred pasta sauce has 320mg of sodium per serving, but only 50 calories? Time to look for a different sauce, maybe a "low sodium" or "no added salt" version. 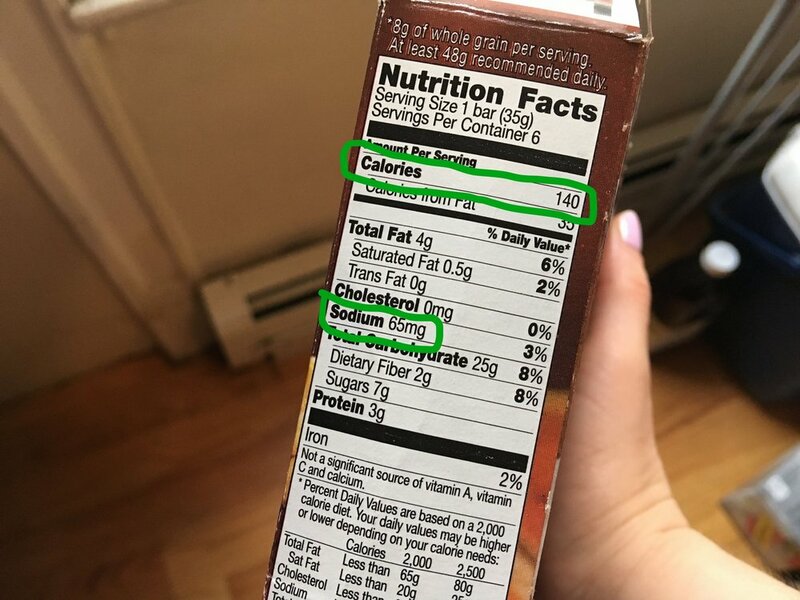 Only 65mg of sodium for 140 calories in these granola bars?! Good deal. There are some foods that just are hardly ever going to have less sodium compared to calories. And that's ok. Don't stress about adding them to your cart. Just choose a "Low Sodium" option whenever available. Send me your pics! Share a photo from your next shopping trip and show off your goodies!